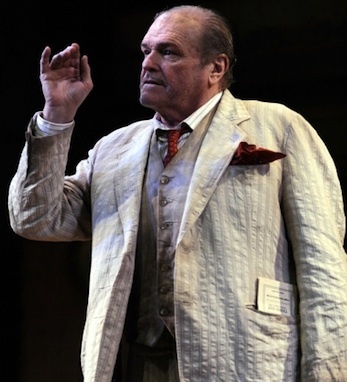 Brian Dennehy’s career has spanned over 60 films and 100 TV movies and stage plays. Surprising, then, that it took the esteemed actor a while to throw himself full force into the world of acting. Dennehy was born in Bridgeport, CT and raised in Long Island by his Irish-American parents. He attended Columbia University on a football scholarship, went on to Yale to study dramatic arts, and then spent four years in the U.S. Marine Corps, from 1959 to 1963. His breakthrough film role came in 1982, when Dennehy played Sheriff Will Teasle opposite Sylvester Stallone’s Rambo in First Blood. From there, he made a name for himself as a strong character actor, portraying working class Americans on stage and in film with rare empathy and insight. Dennehy has demonstrated a particular affinity with Eugene O’Neill’s plays. He recently wrapped up a touring production of John B. Keane’s The Field in Ireland, and is in production for a film about the Scopes Monkey Trial, the famous court battle on evolution.